The process of photosynthesis is what keeps all plants alive. If you think about it, it is very similar to the human concept of solar cells providing power for our homes. MIT researcher Andreas Mershin has figured out a way to harness that similarity and turn grass clippings and other plant waste into solar cells. 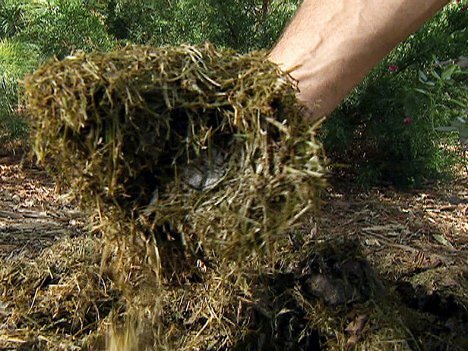 Mershin is so confident in his invention that he claims that in a few years, we’ll be able to take a bag of grass clippings from the yard, mix them into a plastic bag of inexpensive chemicals, and then put the mixture directly onto the roof of a house to start producing electricity immediately. Mershin’s process works by extracting the photosynthesizing molecules, photosystem I, from the discarded plant clippings. The molecules are spread onto a glass substrate covered in zinc oxide nanowires and titanium dioxide “sponges.” Light is absorbed and turned into electricity by the coating, then carried off by the nanowires. Of course, like most emerging solar power technologies, the efficiency of this method is quite low and needs to improve a lot before it can be used in the real world. But if Mershin has his way, it will soon come in a simple DIY kit that will let anyone create their own solar power system.